Born 1970, in suburban Helsinki, unplanned, to a forty-year old Mother / Housewife / random job taking Secretary and Sea Captain Father, Tomi is the youngest of three by a decade. Both parents were present during Tomi’s birth, unlike his siblings, who did not meet their father until shortly before their first birthdays. Tomi received the absolute best from his parents, they lavished him with love, trust, freedom and support. At the age of seven, Tomi was given a key to wear around his neck, the only instruction was to call if he was not going to come home for the night. Tomi and his father played imaginary games together. One took place in Australia, the country furthest away, a place where anything could happen because everything is upside down. Another, designed to while away hours on car trips by creating casts of characters, Tomi would move fluidly between female and male persona. He invented a hero named “Supergranny”, and a French woman based on Edith Piaf. 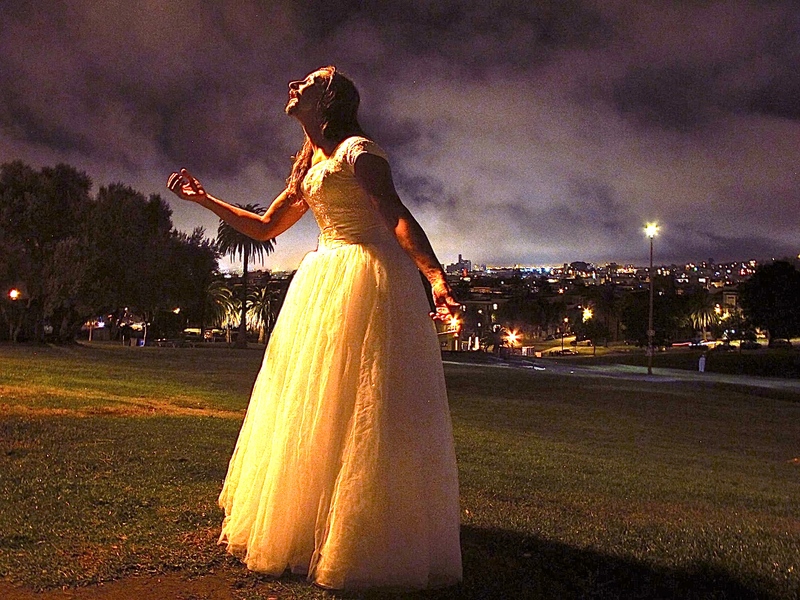 Tomi Paasonen, Dolores Park, San Francisco 2013. Photo Credit: Ivo Serra. Tomi’s sister, a professional Playwright, precedes him by thirteen years. She took on the role of the Art-Mom, introducing music, film, literature and drawing to the impressionable, precocious young mind. The relationship between Tomi and his brother, another story entirely. Through caring for his mentally disabled older brother, Tomi acquired a strong sense of empathy, having to constantly take the perspective of another into consideration. 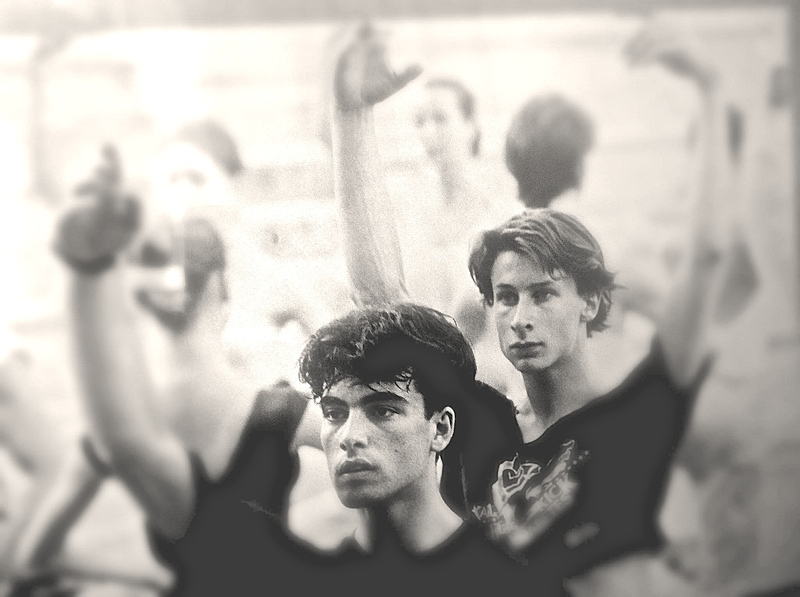 Tomi and Yannis in Ballet Class, Hamburg 1989. 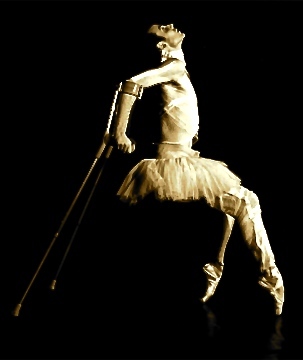 Tomi studied in Hamburg for two years, then signed with the Hamburg Ballet, where he danced for the following five. After that, Tomi was ready to leave classical ballet behind. He wanted to build a career in contemporary dance, he seriously considered an offer from the Netherlands Dance Theater-2 in Den Haag. 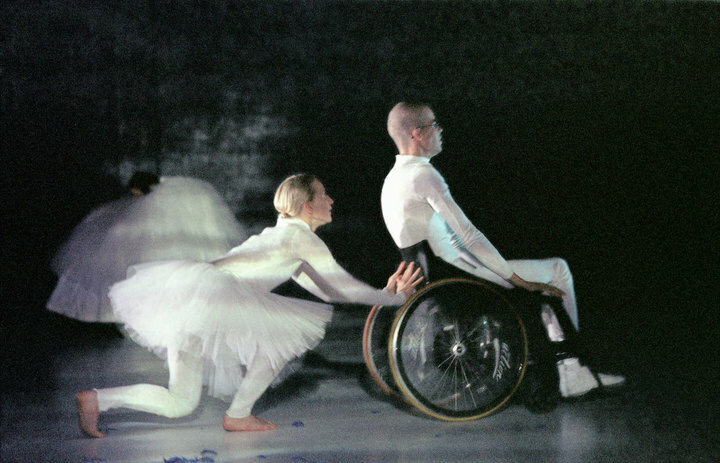 Respectfully declining, Tomi moved to San Francisco to be with Yannis, who had moved to there two years earlier, and was dancing with Alonzo King’s Lines Contemporary Ballet. Tomi danced with Lines for one year as well, then, during the company’s spring season the two split up. Tomi had fallen in love with someone else, a man who lived in Chicago, and followed him out there. Needing to find a job, Tomi auditioned for the Joffrey Ballet, and within two days signed a two year contract. Thus began an era which in hindsight, Tomi describes using words such as, “catastrophe”, “turmoil”, and “disaster”. Tomi’s first year at Joffrey, was to say the very least, a challenging one. He incurred various injuries, and as a result was not in proper shape to take auditions elsewhere. During the second year, Tomi was in far better condition. He went on several auditions, receiving offers from Geneva, Madrid, and the Gulbenkian Foundation in Lisbon. Gulbenkian was Tomi’s dream, he had instantly fallen in love with the city, the country, the company, their artistic mission. They were equally as interested in having Tomi produce original work, as they were in having him perform in their contemporary pieces. Tomi accepted Gulbenkian’s offer, and quietly waited as the remaining minutes on his Chicago clock ticked steadily away. With only one short season to go, Tomi went to morning ballet class, a day seemingly like any other. There were roughly forty people in the room, and tombé pas de bourrée crash – the ceiling fell down on Tomi’s head. He began to laugh and then he fainted. The resulting injury, three herniated discs in his cervical spine, an abrupt and devastating end to Tomi’s performing career. He was the only person injured that day. No longer able to fulfil his contract in Lisbon, Tomi produced a few small projects in Chicago, then moved back to San Francisco in the fall of 1998. He had no money, no structure. 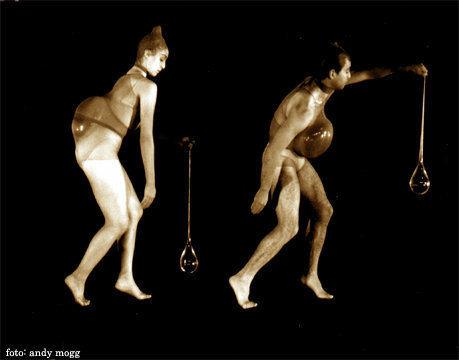 Tomi moved into Yannis’s basement, and began producing original works at a maniacal pace, Kunst-Stoff was born. Creation became Tomi’s outlet, his way of dealing with everything that had happened. Tomi had always wanted to be a director, viewing performance as a path to get him there, though no one, not even he imagined this shift would happen so soon. Juliann Rhodes and Yannis Adoniou in Mega Hz, San Francisco 1998. Photo Credit: Andy Mogg. Nol Simonse in Swansong, San Francisco 2000. Photo Credit Andy Mogg. Tomi directing a workshop, Tokyo 2012. Photo Credit Miki Sato. In Tokyo, Tomi directed 60 amateur dancers, age seven to seventy in Yume No Minato – Harbor of Dreams, a community project performed at Suntory hall. The largest cast that Tomi has worked to date, when realizing it’s magnitude he thought, “Oh my god, I‘m going to make this North Korea mass piece with precision walking!” Collaborating with such a vast group of non-professional performers was a process which Tomi found to be hugely rewarding. “When there are sixty people having strong emotional experiences through the work that they’re doing, and all of the strings go through you, you can imagine how your soul explodes. It’s just such a high that I don’t know, I can understand dictators now.”, he laughs. Katie Gados in Giga Hz, Berlin 2013. Photo Credit: Tomi Paasonen. Masks have played a huge role in Tomi’s work as well, this is a theme which surfaced shortly after the accident. 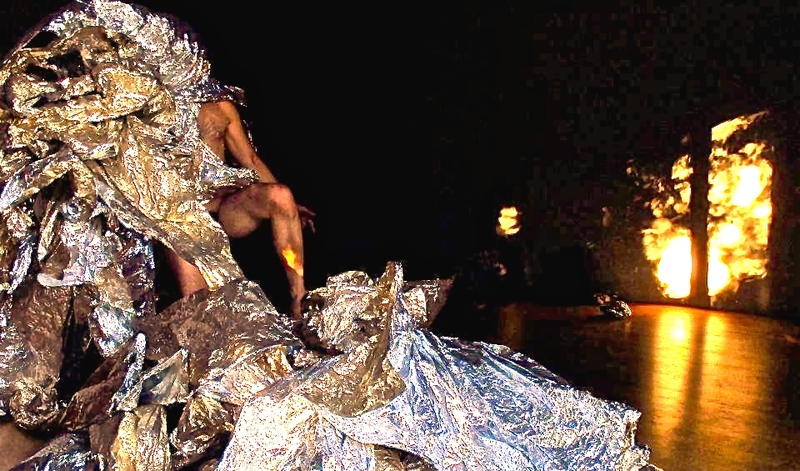 A primary theatrical element, Tomi is interested in removing a performer’s identity, turning him or her into moving sculpture, creating abstracted human form. Tomi’s first go at this was the nylon piece Mega Hz, dealing with themes of sexuality, dancers were dressed in a manner which suggested the idea of condoms. This theme has continued consistently. In 2011, Tomi directed the contemporary opera, Nothing to Declare, at the Finnish National Opera; an absurd, nightmarish commentary on corporate bureaucracy. By the end of the show, the singer and musicians ended up wearing empty cardboard boxes on their heads. 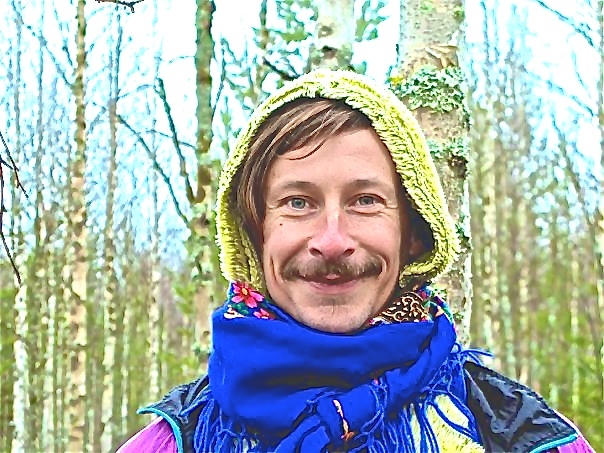 Tomi in Forest, Lapland 2008. Photo Credit: Tiago Da Cruz. About a month ago, Tomi moved to Kuopio, in eastern Finland to begin appointment as Artistic director of ITAK, Finland’s eastern regional dance center, an organization which issues artist grants, curates festivals and programs for various theaters in different cities, supporting the contemporary dance community through mentoring. This new epoch is a result of Tomi wanting to be closer to his eighty-seven year old father, in part, a reaction the heartbreaking loss of his mother in 2012. 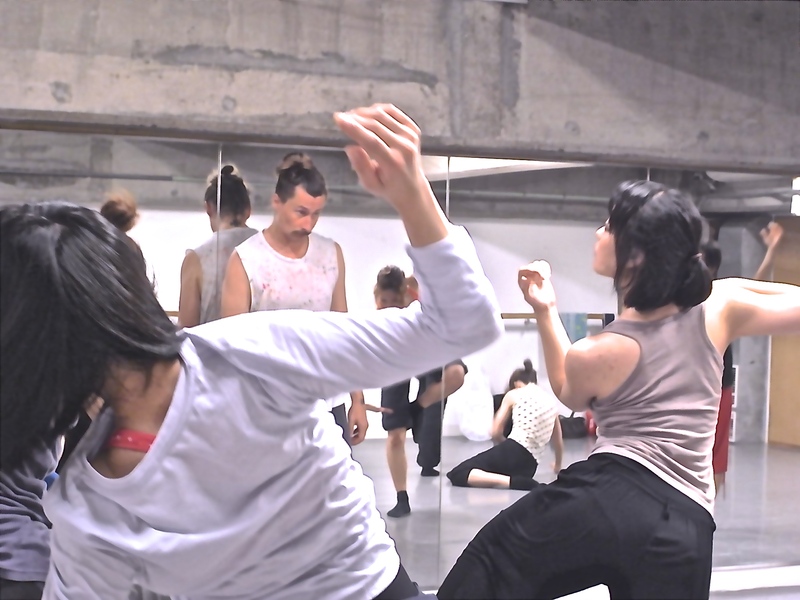 Tomi created a piece surrounding his Mother’s death, a solo work, which after seeing performed at the Kunst-Stoff retrospective in San Francisco last month, I would argue to be a pas de trois between dancer, musician and foil. Those Golden Years, shares the story of a dream that Tomi had the night before his mother passed away. The movement of Yannis’s naked form, rising like a phoenix from underneath a sea of golden foil, snaking his way in and out of the metallic bolts, moving through space, accompanied by the music of Yuko Matsuyama, herself dressed from head to face to torso to foot in multicolored crocheted doilies, handmade by Tomi’s mother. Utilizing sounds of bells, tea cups, cigarette lighters and electronics to compliment the white noise rustling of foil sheets, she too furthered the narrative in this oddly delicate tale. With only three minutes left in the piece, Tomi’s voice appeared, a recorded prosaic recanting of what we’d all just been through, completing the circle, or in this case, the krackly golden heart. It had been a little over four years since I sat in a room with one of Tomi’s pieces. I felt as always, that I had just experienced something very sad, very beautiful, something very strange and exceptionally genuine; something which I would consider to be indicatively Tomi.